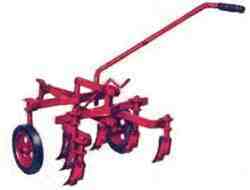 REAR-MOUNTED CULTIVATOR (Mfr No. 990205) Adaptable to many crops, soil conditions. Working depths easilly controlled by parallel tool lift and screw regulator. Tools are staggered to shed trash. Works astride or between rows. Use with all tractors. Recommend front counterweight 990044. Specifications ... Parallel tool lift, Two 3 gang tool holders. Two 10x 1.75 rubber-tired gauge wheels, 6" - 8" steels, reversible. Shipping weight: 87 lbs. 36" ROTARY SNOW THROWER (Mfr. No. 990187) Cuts 36" swath through deep snow. Revolving outlet duct throws snow in any direction. 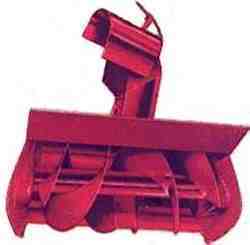 Tractors use 990218 rear counter weight kit. With Model V tractor series use belt and pulley kit 990188. Tire chains 990181 are recommended. Specifications ... Swath width: 36". Outlet duct: revolving, controlled from tractor handles. Duct cap: adjusts to throw snow any desired distance. Equipped with drift cutters. Shipping weight: 110 lbs. 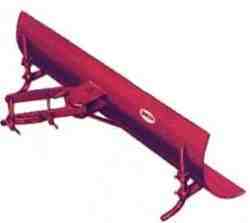 30" AND 42" SNOW PLOW AND DOZER BLADE (30" -- Mfr. No. 990037, 42" -- Mfr. No. 990038) All steel blades clear snow quickly, easily. Blades angle left, right or straight ahead for light grading, cleaning farm buildings, poultry runs. Adjustable gauge shoes. Use with all Simplicity two-wheel tractors. For greater traction in snow plowing and heavy grading, 990046 wheel weights and 990181 tire chains are recommended. Specifications ... Swath width: 30" or 42". Blade height: 151/2''. Shipping weight: 30"-- 36 lbs. ; 42" -- 44 lbs. Specifications ... Blade: 20" or 26' length, tempered cutting edge. Rotor shaft: timken roller bearings. 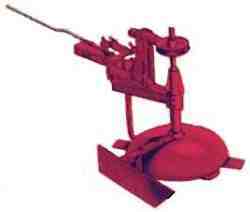 Adjustable cutting height, Shipping weight: 20"-50 lbs., 26" -- 51 lbs.